The Great Monday Give for this week (since we upgraded) is a used but still awesome paperback copy of Mercer Mayer's One Monster After Another. To be entered to win, all you have to do is comment on this post between now and Sunday, January 23 at 11:49 PM. A winner will be randomly selected and announced the next day. The winner of last week's give of Sam and Emma, illustrated by Edward Gorey, is Jennifer McNichols. Congrats and send me your info to webe(at)soon(dot)com. Good day, friends. This looks like it was inspired by Maurice Sendak. Nice. It also remembers me of Sendak! I loved this book when I was a kid! I would love to be entered! I loved the Mercer Mayer books as a kid! The text reminds me of Jabberwocky. Don't enter me. We already have it. Love it. Just wanted to chime in. I hate that I've found your blog by the way. I've spent way too much money on books in the last two months. I used to read Mercer Mayer books! I'd love to be entered! I love Mercer Mayer and would love this for my son. Not an entry: Someone is going to be very lucky to get this awesome book! I love Mercer Mayer! I wanna try it!Thank you for sharing! These are new to me! I often wish I was a kid again and able to pick my own books (so I'm doing it now instead :) - I would sure choose this! Thank you for the chance at this one! 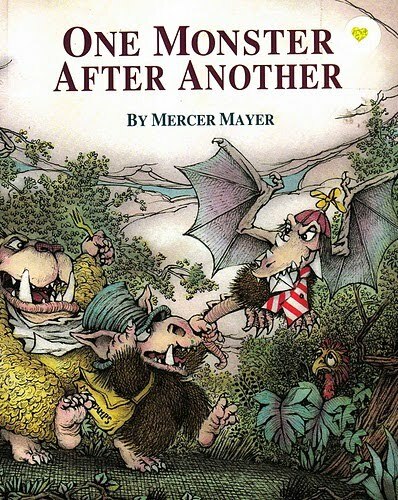 Mercer Mayer's illustrations are like comfort food to me; warm, cozy and friendly - even when they are monsters! I've been searching for this book for a couple of years. Keeping my fingers crossed. Read this book to my daughter a few months ago and this was an instant classic. Love to have this book at home instead of checking this out at the library. I really want this book. Keeping my fingers crossed! I will have to get this one, one way or another. Wow! That's a blast from the past! Haven't seen it floating around too many places either! Thanks for sharing! We would love to win this, along with everyone else. Thanks for the chance. I loved that book when I was a kid! It reminds me of my grandma's because she had it at her house. I love those monsters. What? A fabulous Mercer Mayer book I haven't read? Looks great for a monster storytime! Mercer Mayer is one of our favorites--would love to be entered! I love Mercer Mayer! My kids and I have read SO many of his books. I would love to win this book for them! Thanks for the chance. I love Mercer Mayer's work, which I especially associate with the forever-great Great Brain Series (John D. Fitzgerald, author). Thanks for the chance to win! Found How the Trollusk Got His Hat yesterday at the thrift store. I got it, and it's all your fault! I probably wouldn't have even picked it up if it I hadn't seen this post relatively recently. My 5yo son has read it 3 times already. Thanks! I love Mercer Mayer. The 1st book I ever read on my own (more than 40 years ago! ah!) was "There's a Nightmare in My Closet." I enjoyed reading Little Critter with my baby sister. Thanks for the giveaway! We love Mercer Mayer around here!